OK, a photo for my foodie friends. 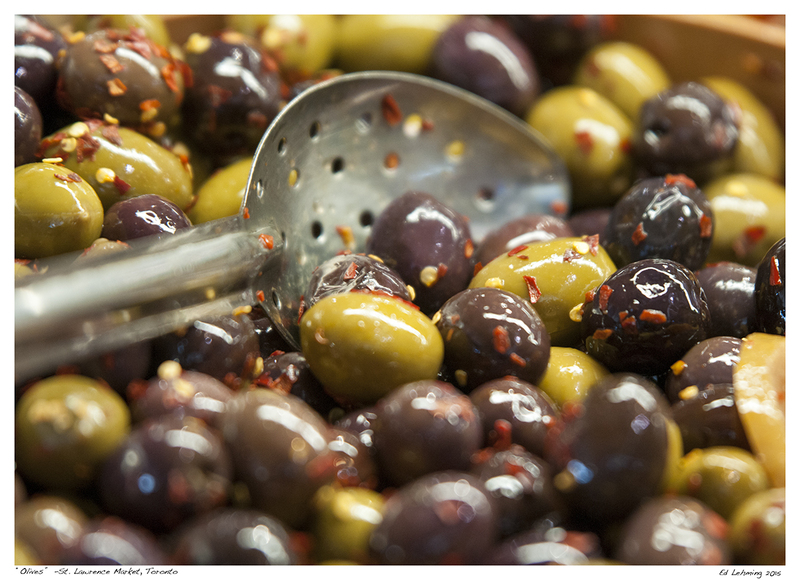 Who can resist a good olive? This is a photo of one of the many olive and cheese vendors at the St. Lawrence Market in Toronto. The market offers a huge variety of fresh foods to suite almost any taste. It is colourful and busy and a must if you like food. This entry was posted in Photography on March 31, 2015 by Ed Lehming Photography. I thought I’d go for a hike today to check out the waterfall at the Whitevale dam. It’s always a nice location and the walk in along the river (Duffins Creek) is quite scenic. I found the trail surprisingly icy for the time of year. There was still lots of snow in the bush and chunks of ice floating in the creek. The problem with this time of year, aside from the treacherous trails, is there is an almost complete absence of colour. The trails are a dirty gray, the creek is muddy brown, and the forest is a muted brown with dull green for the cedars. I was happy to see this little splash of golden brown when the sun lit the stems of some weeds along the path. I also liked the strong vertical lines and the hint of blue sky in the background. I think I’ll wait a few weeks before venturing back. Who knows, by then a few wildflowers may be poking through. This entry was posted in Photography on March 29, 2015 by Ed Lehming Photography. 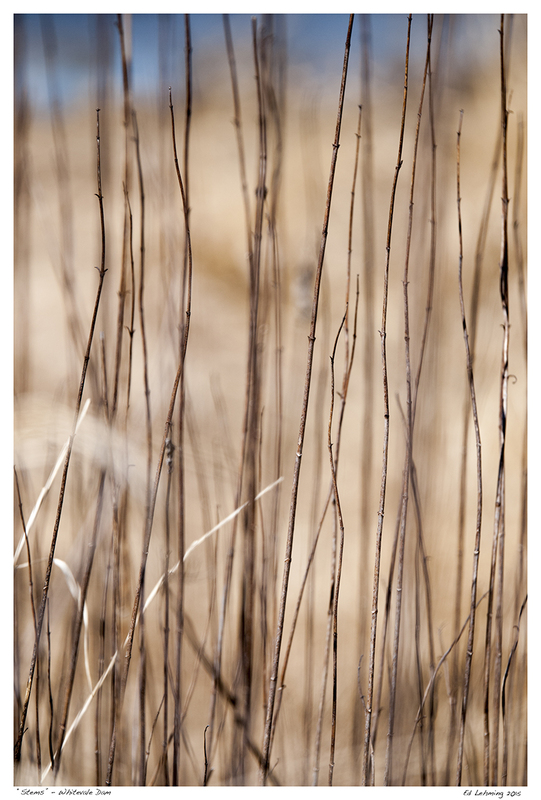 On a bright, sunny late December day, I ventured out to a local conservation area to get some nature photos. About half an hour into my hike a few gentle flurries began to fall. I checked the forecast for the area and it said “Chance of flurries”. Well, the flurries grew into a full on squall. It was really the first significant snow for the area and the plants still had a late fall look to them. The words “Chance of a flurry” kept going through my mind as I saw the world around me quickly transform into a winter wonderland. 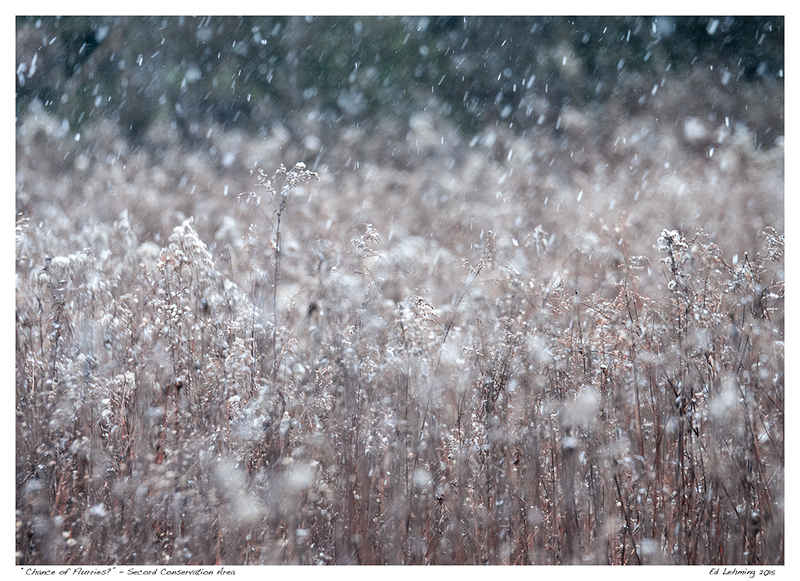 I made the attached photograph just as the squall started and it nicely captures the big snow flakes against the dry goldenrod in a meadow. The snow got even more intense and never let up for the duration of my hike. By the time I got back to my car, the world around me was completely covered in a fresh blanket of snow. What a difference an hour can make. This entry was posted in Photography on March 28, 2015 by Ed Lehming Photography. A return to my previous location. Actually, the same day and about 100 yards away from the location where I photographed the Poplars at Secord image posted yesterday. 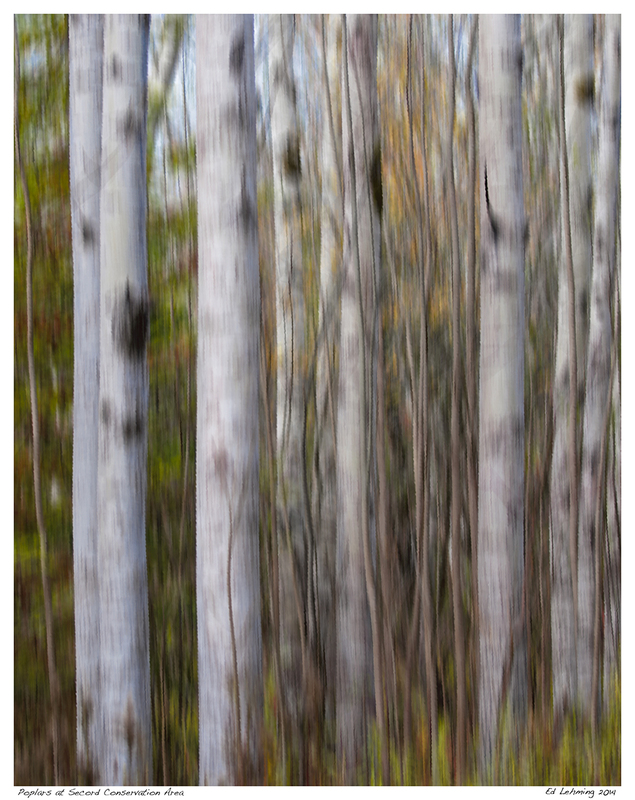 This is a stand of birch trees photographed in the same ‘abstraction’ style I have become so fond of. Essentially, I look for strong vertical elements and background colours. This particular time of year (Mid-late October) lends itself well to the technique because of the feel of the slightly diffused light and the presence of bright colours that jump out of the background. This entry was posted in Photography on March 27, 2015 by Ed Lehming Photography. 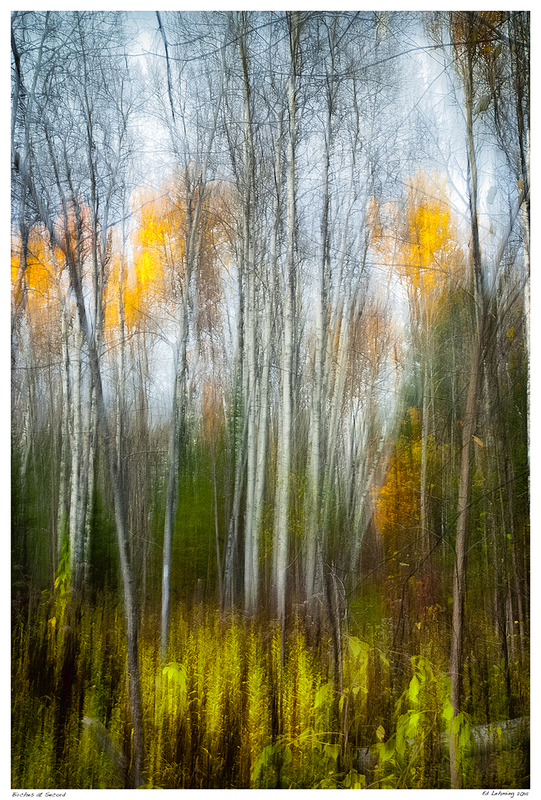 This is one of my all time favourite tree abstractions. It was a mid fall day and the light was soft but bright. It was a time of transition. Many of the leaves had fallen and the underbrush was thinning. In the background, you can make out the yellow leaves of other poplars as well as the bright greens of balsams. The saplings among the poplars seem to be dancing with motion. It reminds my of some fairy tale scene and gives the impression of a painting, rather than a photo. This entry was posted in Photography on March 26, 2015 by Ed Lehming Photography. I keep finding myself going back to these images from January 2015. 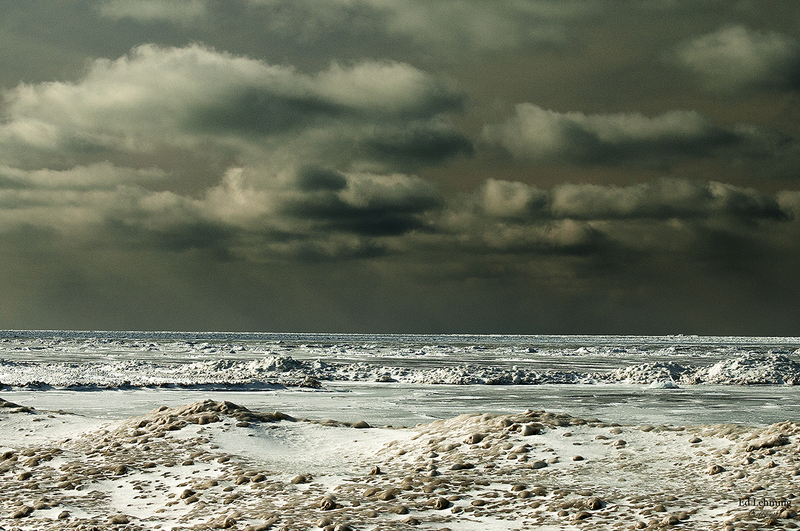 In this photo, the ice sheets extend out into Lake Huron, near Point Clarke, to about 2 miles. The weather had been relatively mild for January, but a sudden deep freeze caused the thin ice to pile up and rapidly freeze into an extended, but thin “shelf”. Because the open water beyond the shelf was still relatively warm, moisture laden air rose up into the dark snow clouds you see in the distance. It was sunny where I was standing, which lights up the snow and ice nicely, but is a strong contrast to the snowstorm occurring off-shore. This entry was posted in Photography on March 25, 2015 by Ed Lehming Photography. A far off mountain range in some distant land? No, this pile of snow and ice was photographed along the shores of Lake Huron in January. After a relatively mild December, a period of deep freezes and high winds began to push the fragile shore ice into great stacks of ice. High winds and extremely cold temperatures then forced waves under the ice and through cracks creating ‘ice volcanoes’ made of ice, sand and rocks from below the surface. The combination of these elements created a surreal landscape that I have never before experienced. I was so pleased that the photos captured the scale and fine details of this marvellous scene. This entry was posted in Photography on March 24, 2015 by Ed Lehming Photography.